McKinley High has been a battleground for eighteen months since a virus outbreak led to a military quarantine of the school. When the doors finally open, Will and Lucy think their nightmare is finished. But they are gravely mistaken. 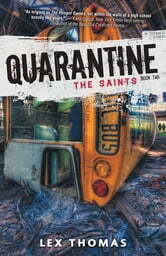 As a new group of teens enters the school and gains popularity, Will and Lucy join new gangs. An epic party on the quad full of real food and drinks, where kids hook up and actually interact with members of other gangs seemed to signal a new, easier existence. Soon after, though, the world inside McKinley takes a startling turn for the worse, and Will and Lucy will have to fight harder than ever to survive. The Saints brings readers back to the dark and deadly halls of McKinley High and the Quarantine series.